What is Salmon Oil Omega-3? Salmon Oil Omega-3 is gently sourced from non-endangered, wild salmon that were sustainably caught in the pristine, cold waters of Alaska. This is a healthier source than farmed salmon, which are generally found to contain high levels of harmful pollutants and compounds such as high cholesterol levels, heavy metals, pesticides, dioxins, PCB's and antibiotics. A more environmentally-conscious choice than farmed salmon, which pollute coastal waters, wild salmon oil is extracted from already harvested salmon, using fish parts that would otherwise be wasted and thereby helping to conserve existing stocks. Containing a rich source of Omega-3 fatty acids as well as Astaxanthin, which is the carotenoid that gives the oil its orange colour, wild salmon oil contains a naturally occurring ratio of Eicosapentaenoic Acid (EPA) and Docosahexaenoic Acid (DHA). Salmon Oil Omega-3 softgel capsules contain pure, wild salmon oil with the same fatty acid ratio found in free-swimming salmon, resulting in high amounts of EPA and DHA, without the need to be fortified with other fish oils. 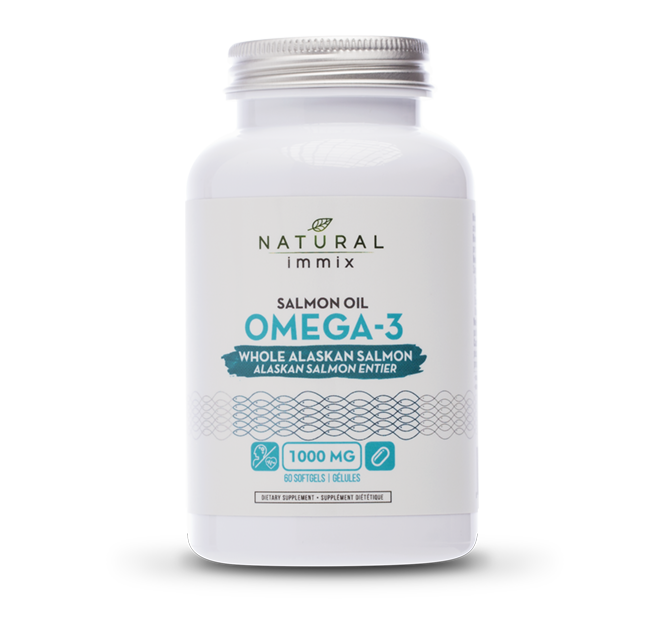 Omega-3's are essential to human health but cannot be manufactured by the body therefore they need to be found in foods like fish and supplements such as Natural immix Salmon Oil Omega-3 softgel capsules. Thousands of studies show the benefits of Omega-3 fatty acids for the heart and circulatory system however, many people do not get enough Omega-3 fatty acids in their diet. Two important Omega-3 fatty acids found liberally in salmon are Eicosapentaenoic Acid (EPA) and Docosahexaenoic Acid (DHA). Both of these fatty acids help reduce low density lipoproteins (LDL's) and raise levels of good high density lipoproteins (HDL's). These nutrients also reduce blood vessel constriction, lower fibrinogen (the blood clotting factor), and keep platelets from becoming too sticky. EPA (Eicosapentanoic Acid): is one of several Omega-3 fatty acids used by the body. It is found in cold water fatty fish, such as salmon. Omega-3 fatty acids are part of a healthy diet that helps lower risk of heart disease. Getting more EPA in your diet has positive effects on coronary heart disease, high triglycerides (fats in the blood), high blood pressure, and inflammation. DHA (Docosahexanoic Acid): is another essential Omega-3 fatty acid found in cold water fatty fish, such as salmon. Your body needs DHA for the proper functioning of your brain as an adult, and for the development of your nervous system and visual abilities during the first 6 months of life. In addition, Omega-3 fatty acids are part of a healthy diet that helps lower risk of heart disease. Our bodies naturally produce small amounts of DHA, but we must get the full amounts we need from our diet or supplements. Astaxanthin: is often referred to as ‘the King of carotenoids.’ Astaxanthin belongs to this class of naturally-occurring antioxidants and is responsible for the orange/red colour of wild salmon oil. Astaxanthin is found in the highest concentration in the muscles of wild salmon and is one of the most powerful compounds in our health arsenal with antioxidant effects more than 65 times stronger than vitamin C, 50 times more powerful than beta-carotene, and 10 times more powerful than vitamin E.